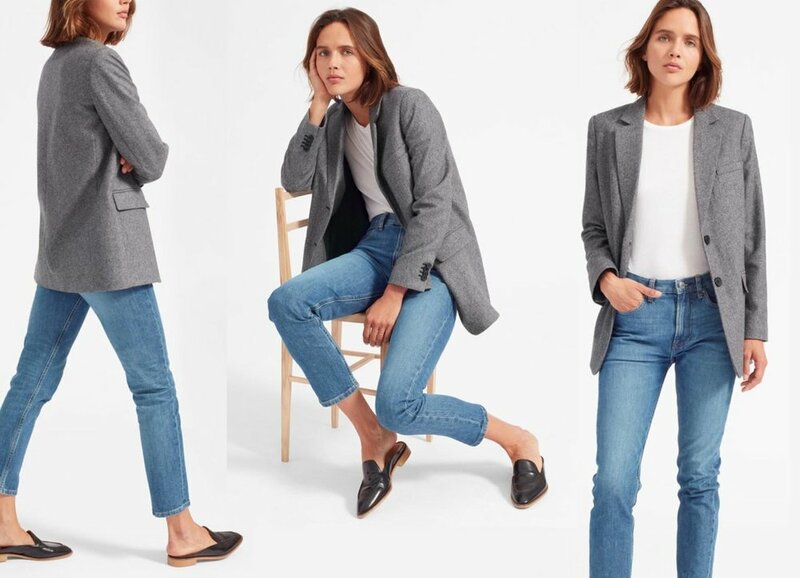 Hi guys, so some of you have asked about Everlane's oversized blazer, and I apologize for how long it took me to finally get this review up (it was a combo of Everlane's shipping time + the backlog of other reviews I had on my list). But luckily it's still available so for those of you who are still interested, you can still snag it online. So back when I was working a 9-5 job as a clinical study coordinator, I was actually known as the blazer girl. My concept of 'professional' equated to blazers, so I basically wore one every day of the week. I had about 10 blazers to rotate from, mostly from Zara with a couple Helmut Lang ones thrown in. When I quit that job to do this Airstream biz, I got rid of all my blazers except one from Helmut Lang like this one (which you never see me wear because I never wear blazers anymore). So I was a tad reluctant to even try this blazer since I know I don't wear them anymore. But since I got several requests, I thought I would give it a shot. Please excuse the hideously oversized jeans I'm wearing, and I know I could have styled these better with skinny or straight legged jeans. Anyway I actually really liked the blazer. The blazer is made from a really high quality wool, while the inside polyester lining keeps it from being itchy. The blazer had a good weight to it and actually feels more expensive than its $150 price tag. The gray herringbone is very much on-trend for the season. Now a very important note about sizing. After discussing the sizing of this blazer with reader Ashley, I knew that the fit was super super oversized. So I went down 2 sizes from my usual Everlane size (I'm usually a 4 and went down to a 0 here)! And I think it actually worked out. It was a smidge snug around the shoulders (I wouldn't be able to layer a sweater underneath this), but I had no problems buttoning it up and the sleeves are the right length. 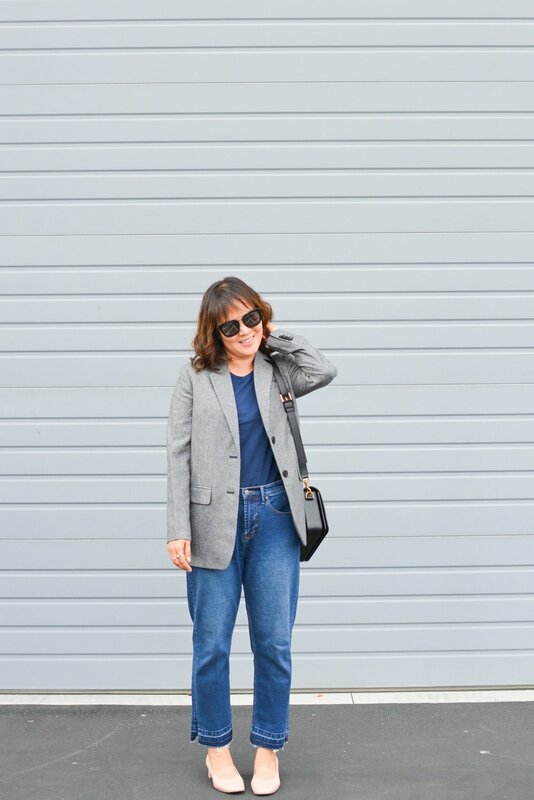 I think if you're looking for a blazer from an ethical brand, this one is a really good option (just size down one to two sizes). As for me, my blazer days are over. One of the perks of working for yourself is you pretty much get to wear what you want. So I'll be sticking to my tee, jeans, and sweaters and I'll leave the blazers to you professionals. P.S. I know this isn't Everlane related just yet but I read this really exciting article about Eileen Fisher and their clothing recycling program. I have yet to buy something from them but I think they might be in my future!